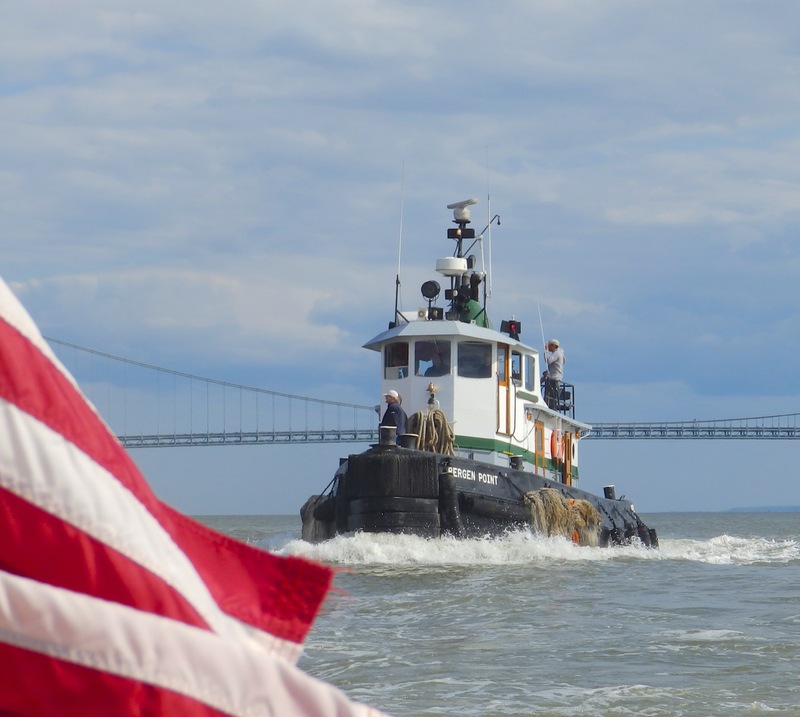 Bergen Point, a 1958 Blount product, coming through the Narrows last weekend. Click here for many interesting vessels from Blount that have appeared on this blog. And a first timer on this blog . . . John Parrish. Penn No. 4 all painted white . 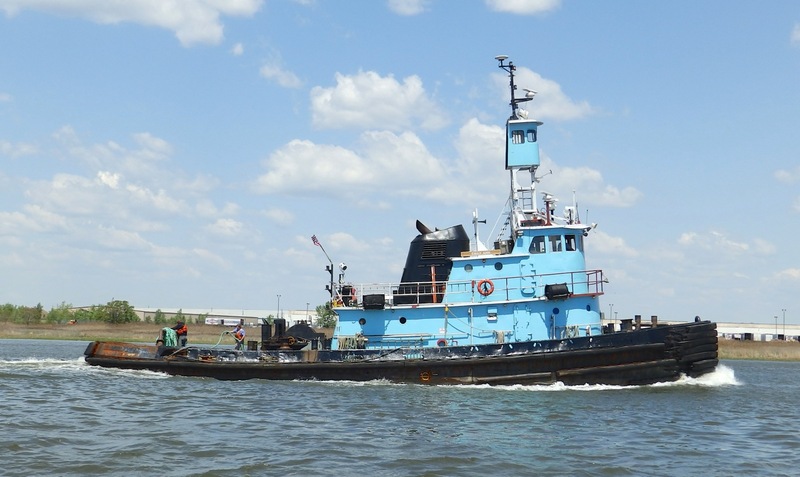 . . click here and scroll through to see her in PennMaritime gray. Bluefin . . still in PennMaritime gray . . . or is that primer? Maryland . . . with reflections. If my search window serves me right, then this is the first appearance of Katie G. McAllister on this blog. This is definitely the first appearance of Pelican State here. 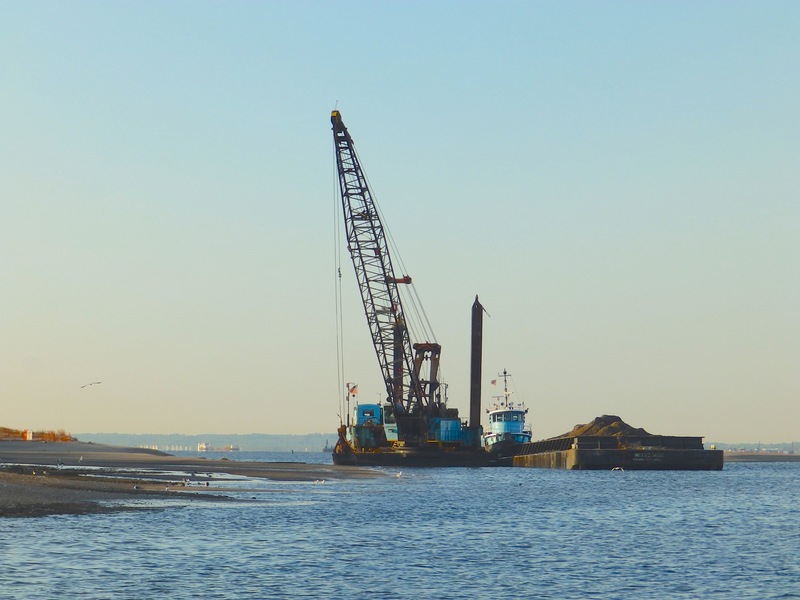 The photo of this Great Lakes Dredge & Dock boat is here thanks to Mike and Michele Mcmorrow. A previous view here of Emily Ann had her as Solomon Sea. Brian Nicholas at work in Great Kills. Click here (scroll through) to see her as both Banda Sea and Brian Nicholas. And finally . 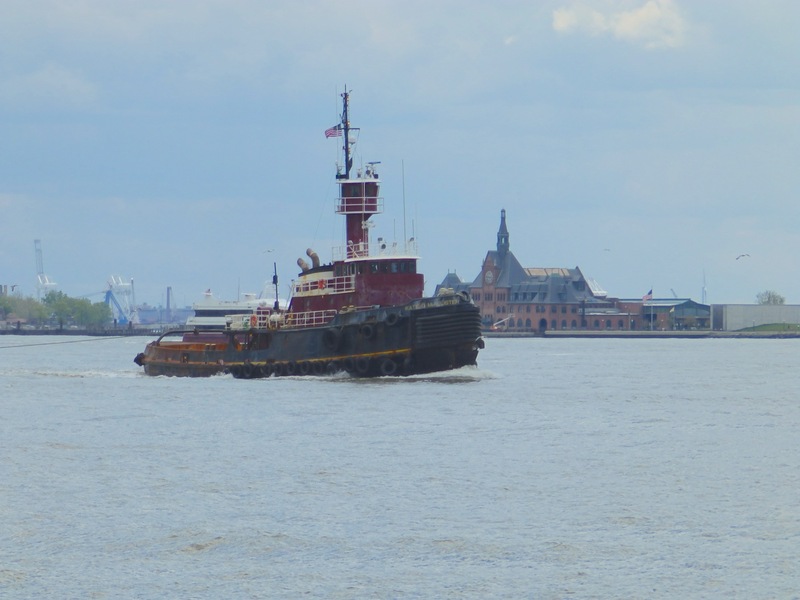 . . it’s the mystery tug Elbe when it was Maryland Pilot boat Maryland. At its stern is its predecessor, Baltimore. I haven’t found out much about Baltimore. Any help? About Maryland, Capt. Brian Hope–who shared this photo, said this, “In 1985 and MARYLAND was donated to Greenpeace. 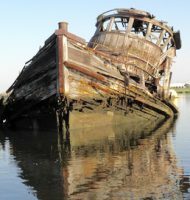 She was a great boat, but too expensive to operate. She had a crew of 18, plus a chief steward. The crew worked two weeks on and two weeks off, so that, counting the steward, we had a total of 37 crew. When we went ashore that was reduced to about 21 and our fuel, repair and food costs dropped dramatically as well. I am very glad to see that she has been preserved (in Maassluis). 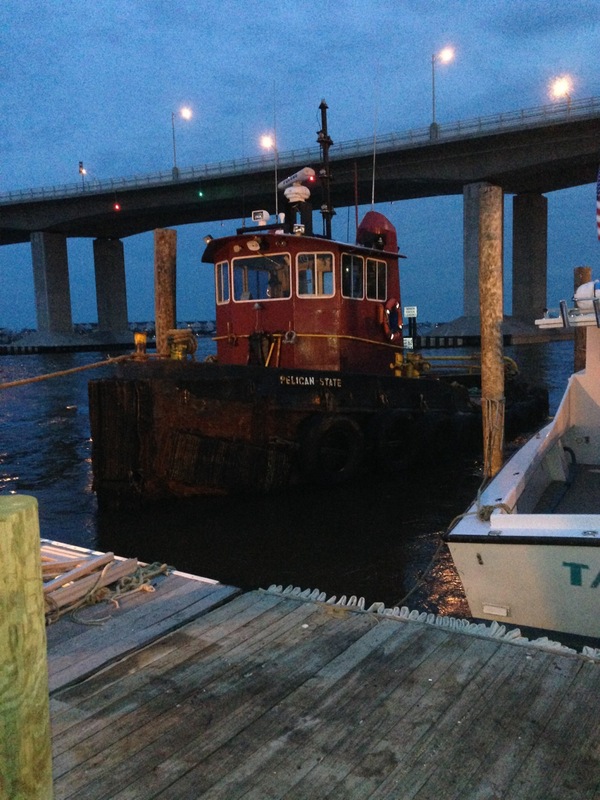 She’s a great boat!” Thanks to a generous reader, here’s an article about her sea trials. When next I post, I hope to share photos Elbe in her restored glory. Sorry to miss NYC’s fleet week again. Pilot vessel BALTIMORE built at Pusey & Jones as yacht RENE in 1930. WW2 served as U S S BERYL PY-23. Became BALTIMORE in 1947. 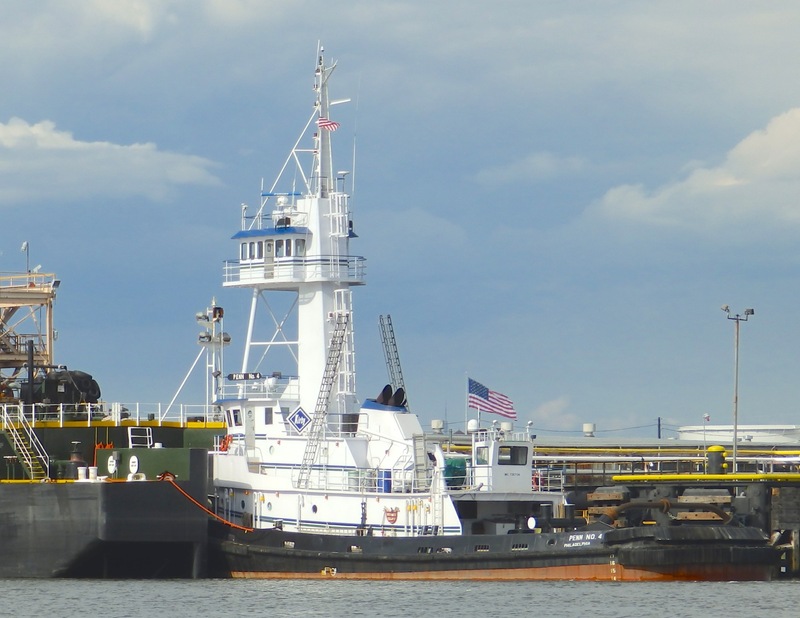 Laid up and sat at various ports for years until eventually scrapped at the N Y S B sheds in Camden,NJ 198? The Baltimore began life as the René, second of three similar 236-foot motor yachts built for three Detroit automobile industry executives by Pusey & Jones and designed by Cox & Stevens, 1929-1930. The other two were the Cambriona, owned by car body manufacturer Fred Fisher, and Nakhoda, owned by Fred Briggs, also an automotive body manufacturer. Alfred Sloan, head of General Motors, built the René (launched 19 September 1929) at a cost of over a million dollars. As testimony to his shrewd business sense, Sloan incorporated the yacht as the René Corporation, leased the yacht from it, and claimed the lease payments as business deductions. All three yachts were among the most luxurious and largest of the era, propelled by twin 8-cylinder Winton Diesels generating 2200-bhp. While Fisher and Briggs used their boats often, mostly on the Great Lakes, Sloan’s boat spent most of its life anchored off the Shelter Island Yacht Club at the end of Long Island. 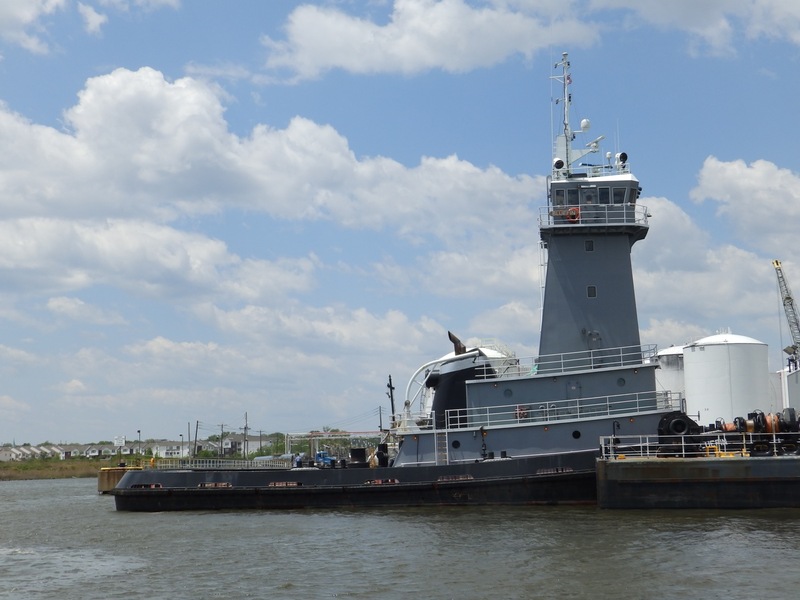 He sold the vessel to the Maritime Commission in 1941 for $175,000 which transferred it to the navy, which in turn converted her to a patrol boat at the Brewer Dry Dock Company yard (now part of Caddell’s) at Staten Island. Commissioned 17 March 1942 as Beryl YP-23 she had quite a far ranging war career, extending from South Carolina to Midway. Decommissioned 25 January 1946 she was sold that year to Seattle’s Skinner & Eddy Corporation for possible conversion to a passenger vessel for the Alaskan coastal trade, but instead S & E sold her to the Maryland Pilots Association which had her converted to a pilot boat at Seattle and brought to Cape Henry. 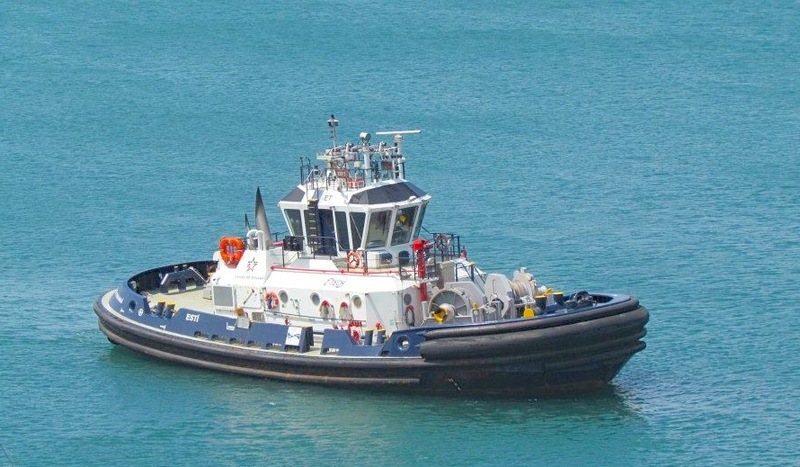 It is interesting to note that all three yachts found similar naval service in World War II, and that the Nakhoda also became a pilot boat, the New York, for United Sandy Hook Pilots. bill . . . thanks much. now i’ve got lots more info to follow up. cheers. What became of NEW YORK (NAKHODA)? I heard she grounded at Key West in 1973 and suffered heavy bottom damage and was to be scuttled….but never could confirm this. Fate unknown. Which probably means she was scrapped. 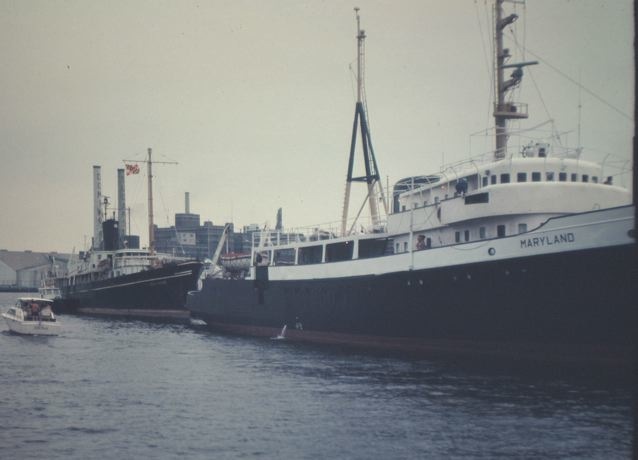 Polymer Engineering was a manufacturer of small metal and fiberglass boats based in Hitchcock, Texas, just northwest of Galveston and south of Houston. The firm enrolled the New York as “recreational” in 1973 and she was dropped from documentation in 1985. She may well have met her end at Key West in 1973. In the mid ’80s the Coast Guard began purging its enrollments with the classification, “Failure to renew,” so her documents may not have been renewed (certainly not surrendered) well in advance of 1985. 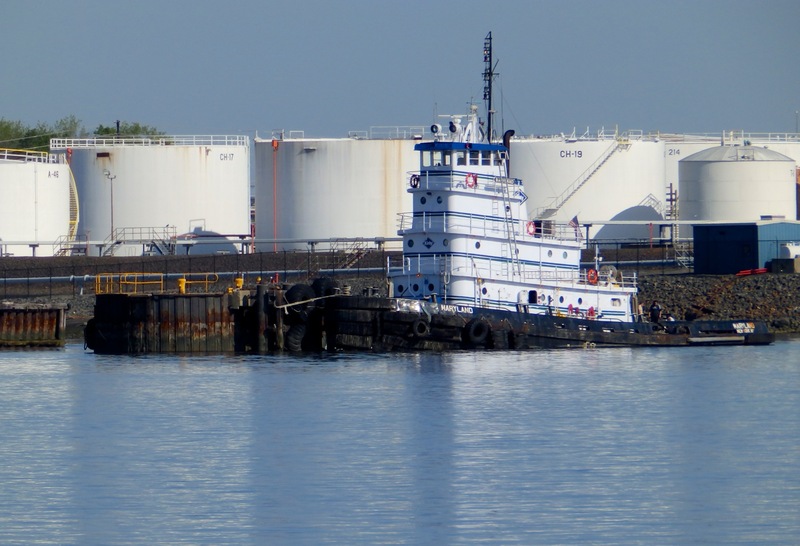 I know of at least two vessels that were sold foreign but received the “failure to renew” designation in the 1980s long after they entered another flag. My father served on the USS Zircon (PY-16), formerly the Nakhoda (and eventually the New York), and I’m trying to locate what happened to the ship post-1973. I’ve sent postcards to the son and grandson of the person I believe who purchased it in 1973 (John Mecom owned Polymer Engineering Corporation), but neither have responded. I’ve also contacted the National Archives in Houston, which (I hope) has it listed on a registry. 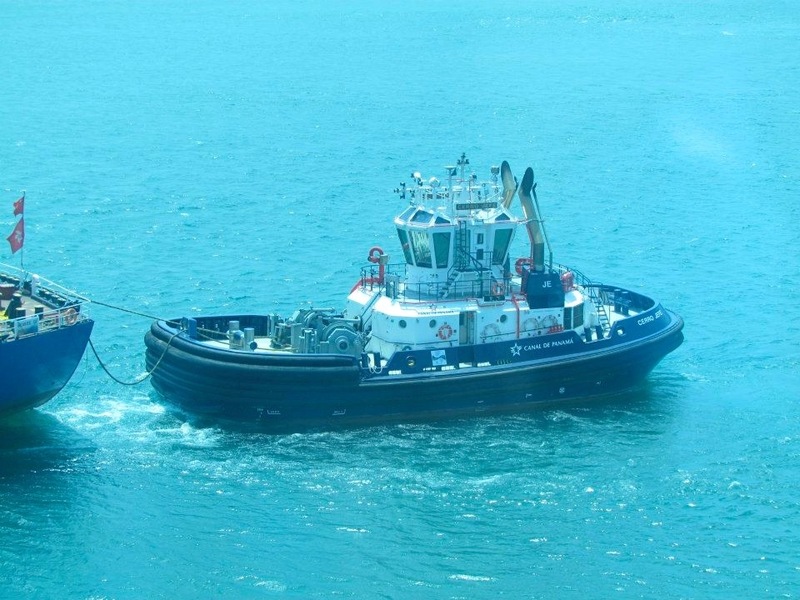 Any information about its possible grounding in Key West, if indeed this is what happened, would be greatly appreciated. Bonjour I am Alain L.Connan French Merchant Marine Captain retired on January 1983 after 18 years like Capt’n on cargo ships and Liners.At this time I became Captain volonteer for the Marine Division of Greenpeace International.On 1985 I was in charge to take the good ship MARYLAND like Capt’n.Before the signature I was for on month about at sea with the Maryland’s Capt’n and crew.Becoming the motor vessel GONDWANA under the US Flag I have cross the North Atlantic Ocean for Europeans Shipyards in the way to modified the ship for Antartica.I have been Chaiman for GP France and Captain on the Rainbow warrior the second after the French bombing on the RW 1.After 10 Years I have continue to be Capt’n for hospital vessels in the Bengal.My last ship like Master was the RW 2 becoming Rongdhonu hospital vessel in Bengal from Singapour to Chittagong. I am 82 now and still busy with a shipyard in Chittagong.I have try many times to keep contact without results with my friends Captain and crew of the Maryland Number one and some pilots of the Cape Henry. Captain Connan– maybe you can send along a photo of your model? Thanks for writing.